New follower from WOW.... glad to be part... have a wonderful week. Rachel Joy en RaeBeth: that's what the rabbits are for! They'll eat the grass, so I won't have to mow it. And I hear Little Bo Peep does lawns too. Get some goats, that will take care of the lawn issues! 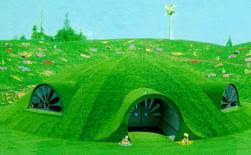 ;) I kinda like it, like a little hobbit hole. Oh my gosh...my oldest (who is 14 now) used to love the Teletubbies whenever he was little. In fact, he had the little red plush doll that spoke.